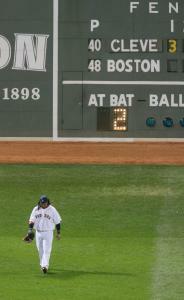 The first round of curtain calls last night at Fenway Park, while well-deserved, proved premature. The bows by Manny Ramírez and Mike Lowell after their back-to-back home runs in the fifth inning were a Hallmark moment for the Red Sox in Game 2 of the American League Championship Series, especially for Ramírez, who became the all-time leading home run hitter in postseason history (23 and counting). But the winners' handshakes did not come until long after midnight, and when they did, they were initiated by Trot Nixon, Cleveland Indian, whose tiebreaking pinch-hit single in the 11th inning served as blowtorch to a seven-run uprising that gave the Indians a 13-6 win and tied the best-of-seven series at a game apiece. "I was excited to finally get in there - it was 1:30 in the morning," said Nixon, who signed as a free agent with the Indians after the Sox cut ties with him, and wound up as a backup to rookie Franklin Gutierrez by the end of the season. "For some reason I felt some calmness in the batter's box. If you can keep your emotions in check, you have a better chance. I didn't hit it hard, but I hit it where I needed to." The Indians were big losers (10-3) in Game 1, but that should have served as a cautionary note. The last two times the Indians have advanced to the World Series, 1995 and 1997, they lost the first game of the ALCS, then polished off their opponents in six games. The winning rally came at the expense of Eric Gagné, who took the loss after giving up a one-out single to Grady Sizemore and a walk to Asdrubal Cabrera, and the two lefties who followed him - Javier Lopez, who gave up Nixon's soft line single to center and another RBI single to Ryan Garko, sandwiched around an intentional walk; and Jon Lester, who gave up a two-run double to Jhonny Peralta and three-run home run to Gutierrez. The game ended at 1:37 a.m. and lasted 5 hours 14 minutes. "I don't think it's realistic, but it's a nice idea to run through the postseason without losing," Red Sox manager Terry Francona said. Sox first baseman Kevin Youkilis tried to bring up the house lights in the ninth with an epic at-bat, fouling off six straight two-strike pitches with pinch runner Jacoby Ellsbury on second before lining to center to end the inning. Indians reliever Rafael Betancourt, who had given up a two-out single to Dustin Pedroia before Ellsbury stole second base, threw 11 straight fastballs to Youkilis before the first baseman's sinking liner was caught by Sizemore. Before Pedroia's hit, Indians relievers had set down 12 straight. Betancourt and the reliever who preceded him, Jensen Lewis, both threw 2 1/3 scoreless innings. Winner Tom Mastny pitched a scoreless 10th, and closer Joe Borowski had a seven-run cushion when he entered in the 11th. Gagné, the sixth Sox pitcher and in many minds the option of last resort, entered after Jonathan Papelbon pitched the ninth and 10th. Gagné pitched the ninth inning of Game 1, loading the bases on two hits and a walk, but escaped without a run by striking out three batters. He whiffed Casey Blake to start the 11th, but Sizemore rocketed a single through the right side on Gagné's next pitch. Cabrera came to the plate and Nixon emerged from the dugout, Indians manager Eric Wedge having lifted 3-hole hitter Travis Hafner for a pinch runner in the ninth. "This all falls on me," said Curt Schilling, who was knocked out in the fifth after a yield of five runs on two home runs. "It's all about me coming up small in a big game."